Leading Supplier of Automation Equipment and Manufactured Components for a Variety of Industries. 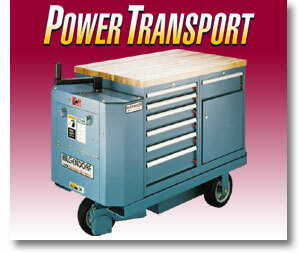 Store, organize, and transport all your tools and supplies. Electric, solid state power is variable, providing smooth starts and stops. Increase productivity while you decrease workers' compensation claims. If you don't see what you want, exactly how you want it, contact us for a quote. Customs are our specialty. Two and three cabinet models available, 6 different styles of cabinets or drawer combinations, interiors and accessories. Contact Hilgendorf for details. LARGER LENGTH: Platform 67" / Overall: 79"
WARRANTY: 1 year on electrical and mechanical, 2 years on drive system. The SmartHandle makes steering a breeze. With one-handed manipulation, operators either lead or follow the transport. In addition, it houses all control functions, allowing fingertip selection of travel speed, forward/reverse, and horn. Heavy-duty construction featuring forklift pockets on both ends and anti-tip wheels make transportation safe and efficient. All HILGENDORF transports are equipped with 3 solid rubber tires. Nonmarking or oil-resistant tires are optional. Base measures 45" or 67" by 29.5". 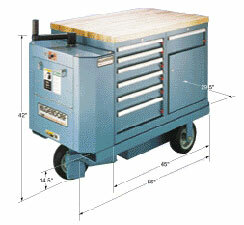 The cabinet top comes in either hardwood, smooth painted steel, diamond plate, or stainless steel. Battery compartment rolls out for easy maintenance. Powered by 3 standard marine-type batteries. 100% full extension drawers give continuous smooth extension, even with 440 pounds (200kg) distributed load. One drawer open at a time safety system prevents tipping. A wide variety of dividers and other accessories allow for custom configuration of drawers with maximum partitioning flexibility. Full-width handles with label holders are standard in 6 different drawer heights. Order drawers completely configured or build your own from divider components. Call for drawer configuration options. © 2019 CSF. All rights reserved.